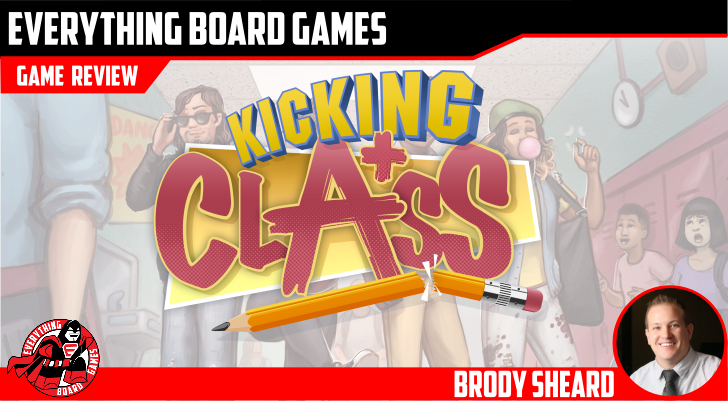 Kicking Class is a dice rolling game where you collect dice to pass certain classes. Whoever passes the most classes, gets the highest ACT grade, and becomes the most popular will win the game. You will start by picking a character, each character have different abilities to use during the game. 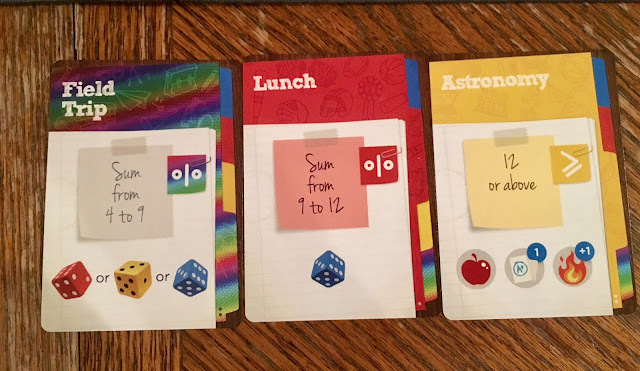 You will be dealt out 2 parent cards, you will end up picking 1 color dice from each parent card from the available options. These dice will be added to your dice pool on your character board. You will then draw 3 action cards. Your parent cards will also be used like action cards and can be played anytime during the game including when its another player’s turn. Each player will place their standee on the fire icon on the popularity track. Each trimester will start with the most popular player and end with the least popular. You will be playing the game starting with freshman year and playing through senior year having 3 trimesters in each year and the possibility of summer school. The school bus token will help keep track of which trimester you are in. The score track is located on the edge of the board, you will add you token to the start, and whenever you take the ACT you will place your token on the highest score you get. You can take the ACT more than once. To do so you will need to end the year with 3 apple tokens. You will spend those tokens to roll 6 white dice. You will add up the sum and this is your ACT score. 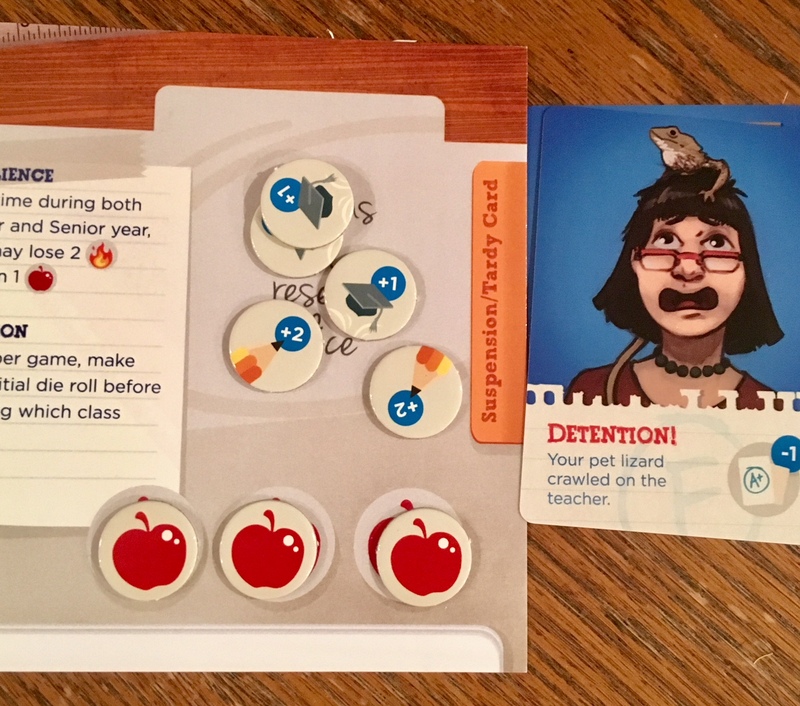 If you have any pencil tokens you can use them to either reroll dice, or to just add the number of pencil tokens to your roll. You will start with the freshman deck, and draw the number of cards there are players plus one. You will reveal the top 3, and after a player passes a class, the next card will be revealed. The most popular player picks which class to take and rolls their dice. 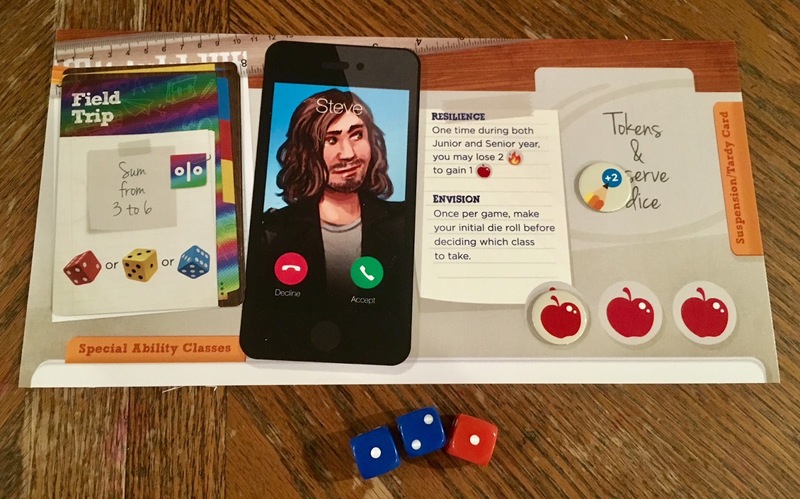 If the class has a color that matches any of your dice, you can re-roll that dice. 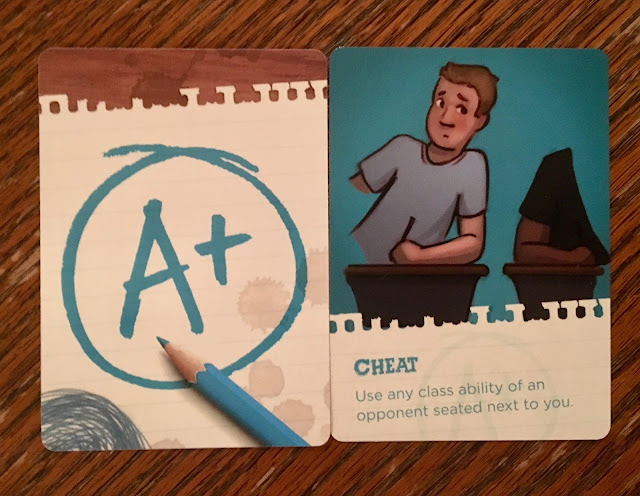 You are trying to fulfill the requirement stated on the card to pass the class, if you do, you get the reward shown on the bottom. 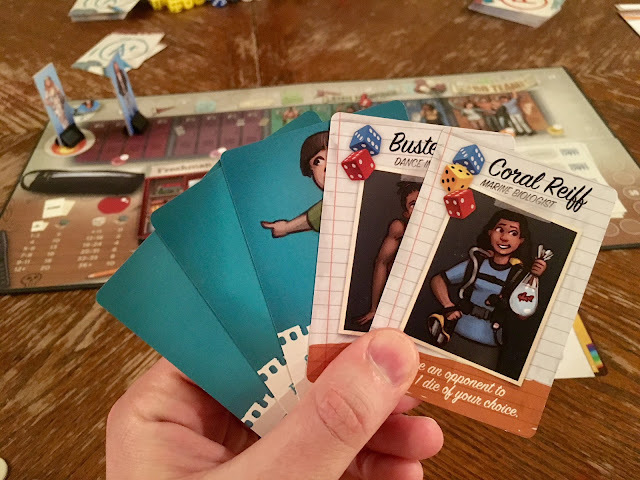 Some cards have instant rewards and place in a pile on your board while others have special abilities that can be used throughout the game, those cards can be placed on the bottom of your player board. If you don’t get the required result, you fail the class and draw a failure card. These can cause you to discard a card, go last next trimester, or you can even get suspended and not get to take any classes next trimester. After the 3 trimesters, its summer, and if you have 3 apple tokens you can take the ACT. If you only passed one class during that year, you can take summer school and try to pass a class the same way you normally would except you don’t draw a failure card if you fail. If you passed 2 or more classes, you can either get a job and take an action card, or you can hang out and go up 2 on the popularity track. You will then change your class deck to the next year. After freshman year you will use the deck for the sophomore year, then junior year, and lastly senior year. After senior year, hopefully you took the ACT once, because if not, you probably wont have any chances of winning the game. The ACT score is about half your score in the game. The track during the game is only used to hold your highest ACT score. So when senior year is over, you will count how many classes you passed and add your score from the chart to the score track, you will then add your points from the popularity track, and lastly if you have any scholarship points they will be added as well. The player with the highest score wins. The theme is what makes this game fun and exciting. You get to relive or redo high school and you will race. your fellow students to claim a full ride scholarship to the university of your dreams. But this scholarship isn't decided by GPA or what clubs you were a member of, the Kicking Class scholarship has it own ranking system. 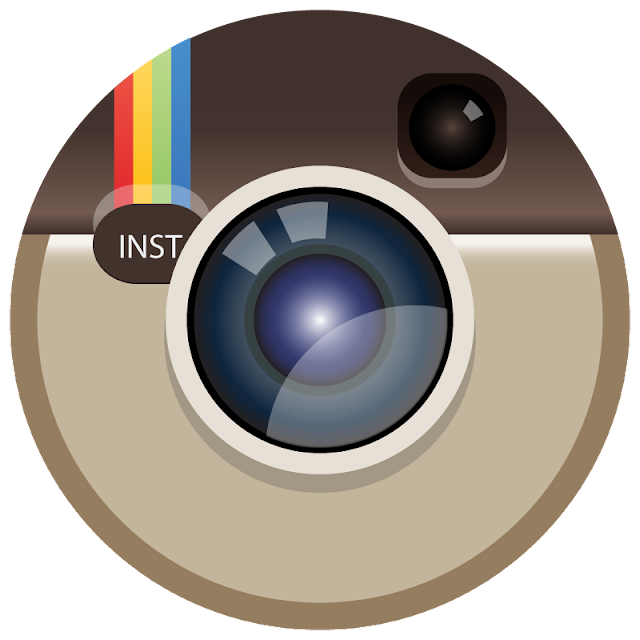 You will take and pass classes, spread rumors, throw parties, and live high school again. 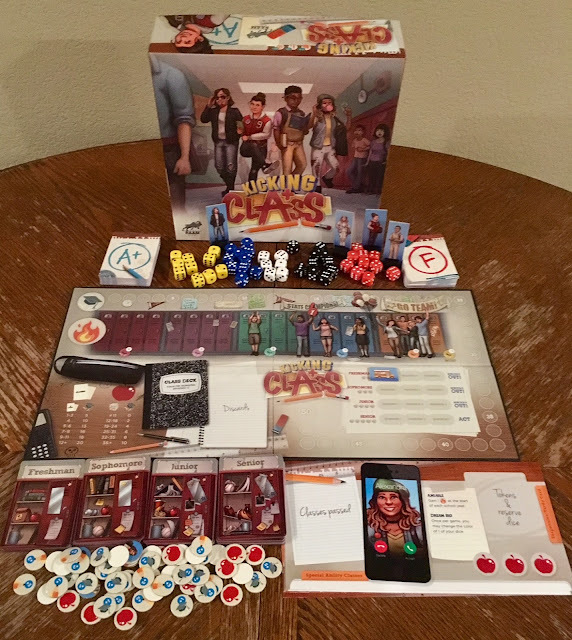 The mechanics in the game includes rolling dice to pass classes, card drafting by picking what classes to take and try to pass, variable player powers because every player has different abilities they can use, and a take that element by use of attack cards. I feel like the mechanics didn't capture the theme well enough to make the game feel thematic. When playing you might only pass 1-3 classes the entire year, or fail up to 3 classes and still move on to the next grade. There were symbols that showed what type of classic belonged to. The symbols are very random and didn't make any sense to why they used those symbols. 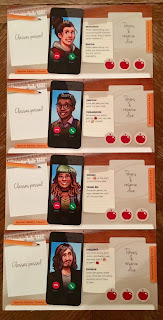 There were some rewards on cards that gave you ongoing abilities, but many times you will never use these abilities due to your chances of passing a class of that type never showing up in the future or the probability of passing that class being so low. I felt like the ratio of take that cards was too high, and many times I wanted a help me card and would draw another take that card. 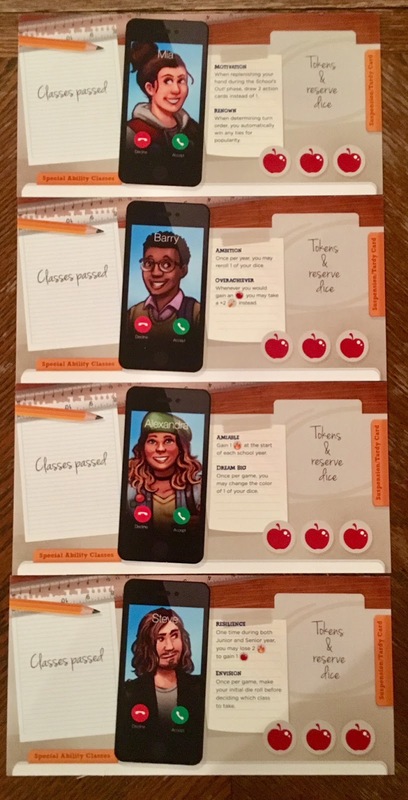 The artwork done for the game is fun and professional. You can see from the pictures that the art matches the high school feel. The components are well done using appropriate thickness for the cards and board. 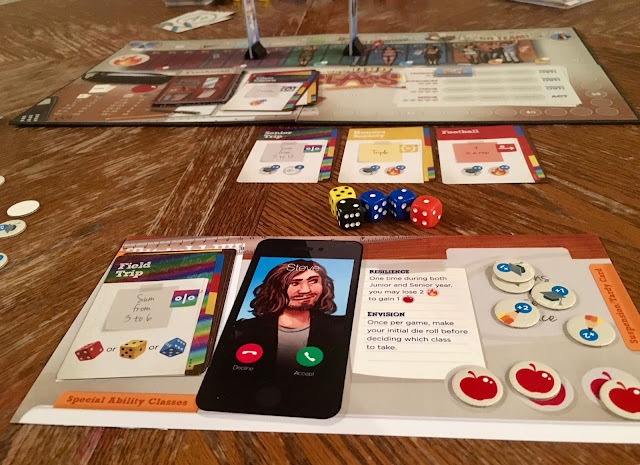 The only thing that could cause the components to pop more is the use of minis and wooden tokens for the score track. Those upgrades really aren't needed and would in return cause the game to be more expensive. 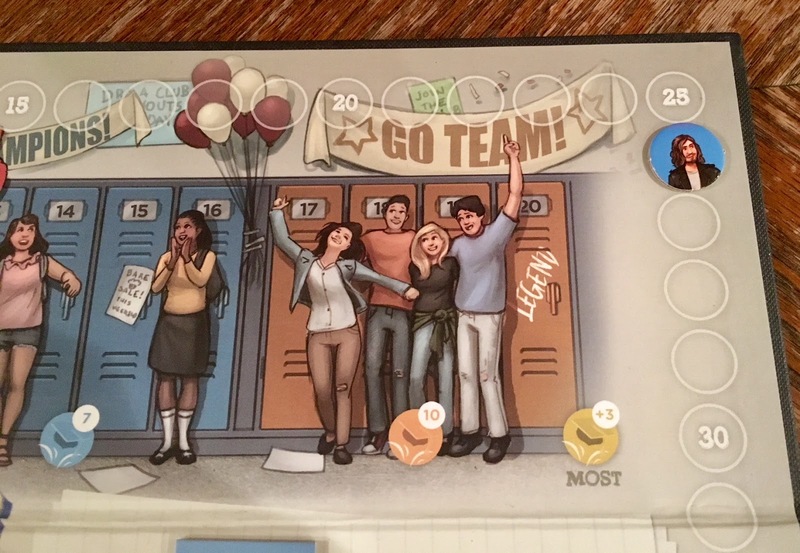 In fact the standees really aren't necessary as you could use a token to mark placement on the popularity track. The game is easy to play and learn. 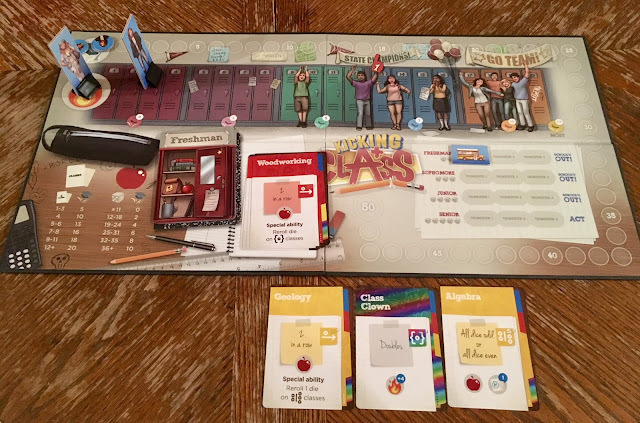 The theme is fun and really invites players to share their high school stories with each other while playing the game. Were you the popular girl? Were you in the band? Were you the one that got a brand new car when your turned 16? Oh wait, weren't you the one who got their house TPed and egged the night of prom? 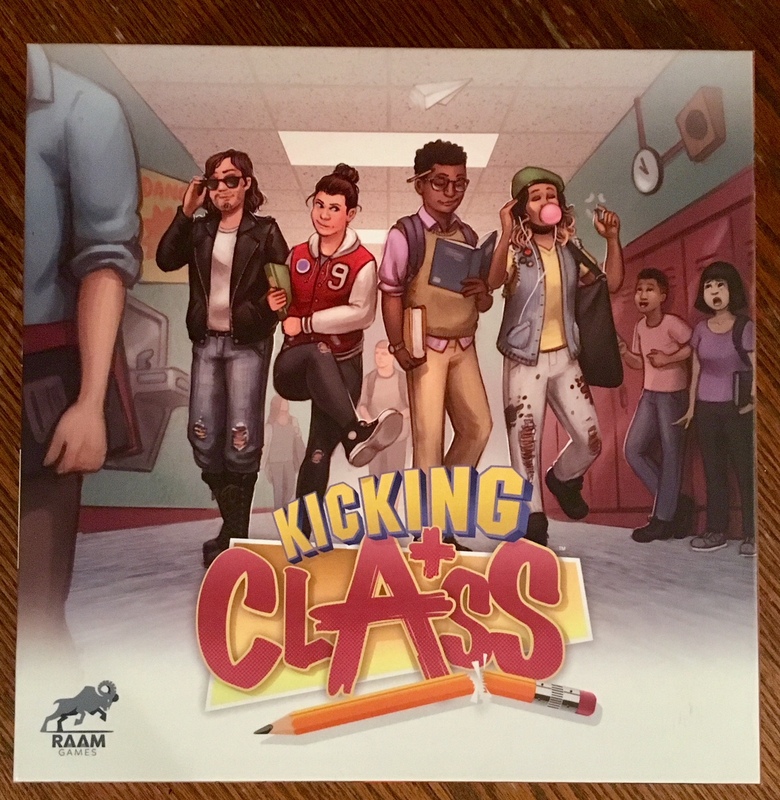 But if you are looking for an entry level game, and would enjoy the theme of returning to high school, then this is the game for you. I hope that during the kickstarter there are some tweaks that can and will help with gameplay. If some of the things I have stated above are changed, I feel like it could make this game really fun and cause the game to be more strategic. The game seems very luck based with few hard decisions. After talking with the designers, the game is meant to be light because the game is intended to be a family game and not intended to be a brain burner. If you are looking for a fun game to play casually with your friends or family that invites players to share their high school stories, then this might be the game for you. Remember that college is a totally different game than high school. The player that wins in high school is not always the same player that wins in college or life. 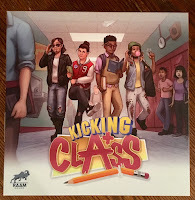 Kicking Class is on KICKSTARTER between now and May 24, 2018.